With greater power comes greater responsibility and greater accountability – and greater compensation. Chief executive officers (CEO) bear the responsibility for making decisions that affect the company’s current and future. And they should be paid according to their level of responsibility and accountability. But the pay discrepancy between the executives and employees is increasing. Wages are stagnating and executives seem to be negotiating better and better compensation packages for themselves, as they become responsible for larger and more complex organizations. This can make CEOs far-removed from the effects of their policies and corporate strategies. It can increase feelings of entitlement and privilege. The median CEO salary was 140 times more than the median employee salary, according to an Equilar anonymous survey of 356 public companies that identified the CEO Pay Ratio they plan to report in their 2018 proxy statements. Among S&P 500 companies, the difference in CEO compensation is even more staggering. In 2017, the average CEO of an S&P 500 Index company made 361 times more money than the average U.S. rank-and-file worker, according to the AFL-CIO Executive Paywatch. What if the top executives voluntarily agreed to limit their compensation? They could agree to accept a salary that is at most 20-times the average salary of their full-time employees, or at most 30-times the salary of their lowest-paid full-time employees. So if the median salary for full-time employees is $50,000, CEOs would earn at most $1,000,000. Or if the starting salary for full-time employees is $35,000, CEOs would earn at most $700,000 per year. And not just salaries. CEOs would receive the same health insurance, vacation, and professional development/education options. But that 20-times limit would include compensation packages, such as stock options, retirement benefits, housing allowances, and guaranteed payments in mergers or take-overs (golden parachutes). 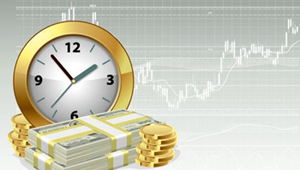 They would receive no more than 20-times what the average full-time employee would receive. I think this would have a positive effect on company morale and loyalty. It could affirm their commitment to the work and values of the company, not just to a paycheck. It could demonstrate their confidence in the decisions they make and a willingness to be accountable for their mistakes. (Not that mistakes should be punished, but that the company can learn from those mistakes). It could motivate executives to raise the wages and benefits for all employees. Businesses are not created to benefit a select few. Businesses provide services, provide employment and experience, and yes, make a profit. And they can do all of that while making families and communities a little better. If we “need” such high CEO compensation, maybe our organizations are too complex. Or maybe we are requiring too much of our executives. Are CEOs worth what they pay for? How much is too much compensation for a top executive? If you are or became a CEO, would you take a 20-times pledge? What will Honolulu look like in 20 years? We have an exciting opportunity to be part of the conversation for Honolulu’s future! My first reaction to the Development Plan is that we should expand the geographic area. The current Primary Urban Center stretches from Kāhala to Pearl City. To would ensure better coordination and consistency of Transit-Oriented Development (TOD) planning, we could consider including part or all of Central O‘ahu into the Primary Urban Center. 1. Beautify roadways and concrete structures. Our first and last look at Honolulu is usually from the H-1 freeway and airport. To beautify the transportation corridors, we could incorporate design elements into the concrete structures along the roads and highways, with appropriate art and color. Designs could inspire (artistry), inform (cultural and historical themes), and/or provide directions (color-coded or patterned themes). For example, different colors or motifs could be planned for each ahupua‘a or geographic region. Design elements could be added to existing roadways, concrete walls, and barriers, and become a planning requirement for future roadway projects. 2. Plan for vertical takeoff and landing (VTOL) aircraft. Flying vehicles may be in use (or at least in street testing) sooner than we think. This could entirely change Honolulu’s urban skyscape. It could reduce traffic congestion, decrease road maintenance, and create a new set of concerns about licensing, privacy, air traffic, and air rights, and revising building codes to include landing pads. VTOL aircraft use could start with police and emergency personnel, enabling them to reach people in high-rise buildings and Hawaii’s mountain trails. 3. Study the feasibility of pedestrian walkways. To connect dense urban neighborhoods with commercial plazas, recreation facilities, and retail centers, we could begin planning for pedestrian walkways above ground-level. By building walkways at the third floor or upper levels, we could improve pedestrian safety and create more store-front opportunities for small businesses. It could also address concerns about flooding and provide alternatives for building evacuation during emergencies. This would be especially useful in dense neighborhoods like Waikiki and Downtown Honolulu. If you’re interested in getting involved and sharing your ideas, the next pop-up events are scheduled for August 22 at Pearl City Library and August 23 at da Shop Books & Curiosities in Kaimuki. You can also join the conversation online and share your thoughts in the online community forum. How do you think Honolulu will change in the next 20 years? What do you envision for Honolulu’s urban center? I was listening to a keynote presentation by Tod Bolsinger, MDiv, PhD about leadership in times of change, and this declaration made me straighten in my seat. Bolsinger had been taking us on an attention-capturing, engaging, and often humorous journey to give us a description of leadership as taking people where they need to go, but resist going. I didn’t expect him to declare that leaders have not succeeded in changing an organization until they survived the sabotage. I didn’t expect to hear that “sabotage” is normal – a common reaction by anxious people when they encounter uncertainty. And I didn’t expect to learn that the sabotage is not from competitors or “outsiders” – it’s usually caused by the very people who supported change in the first place. Bolsinger didn’t spend much time talking about how to deal with sabotage. He moved on to talking about why we become leaders in the first place, what leadership requires, and a reminder that with change, everybody must be changed – especially the leaders. “Sabotage” might be a harsh word for second thoughts, for last-minute caution, or for a sudden fear that the change could make things worse. But the idea of sabotage stuck with me. I wondered whether I have purposefully or unintentionally sabotaged someone else’s drive for change. 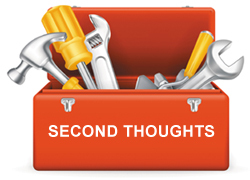 I wondered whether I have sabotaged myself when I tried to change my circumstances. Just as we have a “devil’s advocate” to argue for to argue for an alternate cause, maybe leaders should look for a loyal saboteur to point out the ways that proposed changes might be undermined or opposed. When we expect resistance, it might be easier to overcome – and we might take it less personally. Are there changes that you supported at home, at work, or in the community, but that you later opposed? What made you change your mind? Are there times you sabotaged yourself? There are more and more options to get around Oahu today. TheBus is a solid public transportation system. Uber and Lyft give us a choice of rides. There are more bike lanes and Biki racks. There’s even a car sharing service in Honolulu and Waikiki. Maybe Oahu is ready to take the next step: trading cars for shoes, bicycles, and bus passes. To encourage people to give up their cars and trucks, and encourage people not to purchase their own vehicles, we could come up with a trade-in program. Here’s how it could work: A Hawaii resident and registered car owner with a valid Hawaii driver’s license, with a vehicle in working condition, would agree to sell or donate their current vehicle. They would agree not to purchase or register a vehicle for at least 10 years. 1) Free bus passes for 5 years. Currently, TheBus annual bus passes cost $770 per year for adults and $385 for youth ages 6-17. Total cost: up to $2,310 per year or up to $11,550 for 5 years. In Honolulu, if and when rail transit is complete, there could be an option to choose rail passes. 2) One free bicycle registration per person, which would be redeemed within the first 5 years. Currently, the City and County of Honolulu charges a one-time fee of $15 and a fee of $5 when transferring ownership. Total cost: up to $60. If the car owner registered another motor vehicle in Hawaii within 10 years, the cost of any bus passes and bicycle registration fees that were waived would be added to the first year’s motor vehicle registration fee. * Improved traffic. With fewer vehicles on the road, traffic would hopefully remain the same (it could possibly get better), decreasing our commute times. In 2015, there were 1,242,319 vehicle registrations in Hawaii, according to the US Department of Transportation; though not all of the vehicles are regularly driven. * Longer-lasting roads, maybe. With less traffic, the roads might last longer, or need less frequent maintenance, or be repaired with less inconvenience to drivers. * Easier parking. With fewer cars, parking might be a little easier to find, especially in areas like downtown Honolulu or Waikiki where parking is limited – and expensive. * Decreased driver’s license fees collected. 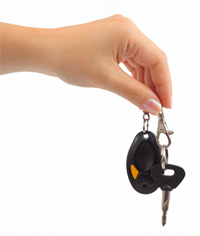 This impact may be limited, as the driver’s license is a widely-accepted form of photo identification. Currently, the driver’s license fee is $40 for drivers ages 25-71 and is valid for 8 years. In 2015, there were 909,797 registered driver’s licenses in Hawaii, according to the US Department of Transportation. * Decreased vehicle registration fees and vanity license plate fees collected. Motor vehicle registration for a mid-sized car in Honolulu might cost between $300 and $400 per year. * Decreased gas taxes collected. In 2015, the Hawaii state tax rate on gas was $0.17 per gallon, plus general excise tax, and motor fuel use was 519,194 gallons, according to the US Department of Transportation. * Decreased bus pass fees collected. Plus, we may need to add more buses. Currently, annual ridership on TheBus is over 68 million. * Decreased bicycle registration fees collected. The impact would be nominal. Two major questions would need to be answered: Can we afford this program? And what would we do with the automobiles that are traded-in? Do you think this would be an effective way to reduce the number of cars on Hawaii roads? What would make you trade your car for a bus pass? 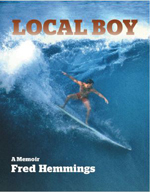 “Local Boy: A Memoir” (2017) by surfer and Hawaii State Senator Fred Hemmings (1946-) is an optimistic and nostalgic memoir about his life. “The years of my life defy my wildest dreams,” Hemmings writes, and humbly admits, “I consider myself a blessed person.” His brief, talk-story reminiscences draw us into his life, punctuated with family photos. “Enjoying the simple things – like the fellowship of surfing with friends – that are life’s greatest riches.” Hemmings enjoys the a life-long appreciation for the outdoors, as a surfer who grew up in the shadows of Duke Kahanamoku and his friends, a football player, a competitive runner who once ran a marathon on a bet, a canoe paddler who learned that you should always take risks when you are behind, and an accident-prone do-it-yourself yard worker. He even relates an unexpected meeting with heiress Doris Duke. “Politics is not a dirty word.” Hemmings shares some of his experiences in the Hawaii State Senate (1984-1990), where he stood up against corruption and death threats. I was intrigued by his 2006 proposal to diversity Hawaii’s economy by creating a College of Sports at the University of Hawaii, with three areas of study: 1) sports management, coaching, and sports facility management; 2) sports medicine, science, and technology; and 3) sports marketing, merchandising, communication, and history. For a preview of the book and videos, visit Hemmings’ website at http://www.fredhemmings.com. You are currently browsing the Better Hawaii weblog archives for August 2018.